After a few months of hot weather, it’s just now beginning to feel like fall in the valley. Leaves are starting to drop and I just opened our windows for the first time. And yet, I’m still making summer recipes. Summer always feels a bit longer in California but I’m okay with that. I’m not ready to see tomatoes leave the market quite yet. If you still happen to have sweet corn, this couscous salad is for you. The sweet corn is left raw which highlights the sweet, delicious flavor. The sweet corn mixture is actually a component and is wonderful serve on grain bowls, added as a taco topping, or used in a quesadilla. If raw sweet corn isn’t your style, saute the sweet corn kernels in a bit of oil then toss with the scallion cilantro mixture once slightly cooled! 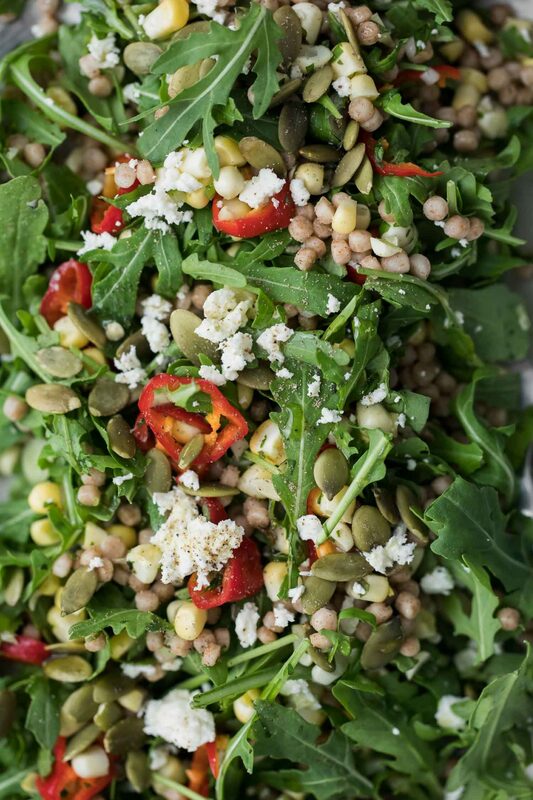 This late-summer salad uses an easy raw sweet corn mixture and is combined with peppery arugula, pickled sweet peppers, and an easy lemon vinaigrette. Chop the scallion through most of the greens. Combine with the cilantro, lime zest, and salt on a cutting board and chop until everything is well-combined and minced fairly fine (as if you were making a gremolata). Remove the kernels from the corn cobs and toss with the cilantro-scallion mixture and olive oil. To the sweet corn mixture add the arugula, cooked couscous, pickled sweet peppers, feta, and toasted pepitas. Prepare the dressing as stated and drizzle a few tablespoons over the salad. Toss, adding more dressing as needed, until the salad is combined and well coated with dressing. Grains: I tried pearl couscous like a grain over pasta. The small shaped pasta holds a bit of texture and works well in many places you might find grains. If you want to make this gluten-free, I recommend using sorghum, millet, or quinoa. 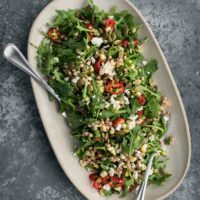 Greens: Arugula can have an extra peppery bite. For something a bit more mild, use spinach or kale that has been massaged with a bit of salt. Vegan: Leave off the feta or make a tofu-feta so that you still have those salty bits in the salad.